Take your practice session to the next level. Preparation is the key to avoiding jumpy nerves at the moment of truth. And there's no better way to prepare yourself for the real deal than by taking aim at GlenDel®'s realistic 3D Buck Target. With the body size of a 200-lb. live deer and a 4-sided vital core that offers easy arrow removal plus 5 times the shooting surface as similar targets, the U.S.A.-made GlenDel 3D Buck Target helps you build the cool confidence that only comes from practicing in true-to-life situations. 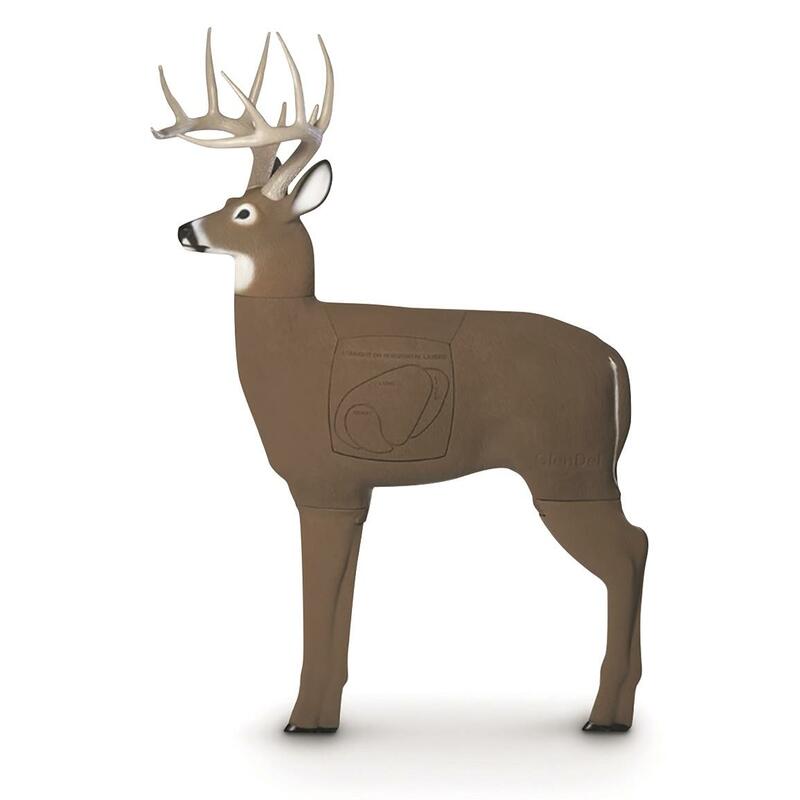 GlenDel 3D Buck Archery Target, Blemished is rated 4.7 out of 5 by 13. Rated 5 out of 5 by Brush Country from Great value Blemish was small foam area missing from top of deer (not in the insert). This has no impact on how the target is used. Target is very functional. Arrow removal is somewhat difficult (much more so than a Block target). I wish you didn't have to be a member to save the additional $9, but still a great value. Rated 5 out of 5 by Rick from Great price, great target! This is my third GlenDel buck and for the price they are the best. I'm still shooting at the first one I bought 7 years ago and I haven't replaced the core yet. I set each one at different distances for my own 3-D range! Rated 5 out of 5 by RER01 from Great Product for a Great Price! I have used the target several time now and am extremely happy. Arrows pull out easily. The target is light weight which makes it easy to take in and out each time you want to use it. Small blemish but not noticeable and its a target you are putting a new blemish on it every shot. Very pleased! Wished Sportsman guide would put other high quality 3D targets on sale like this. Rated 5 out of 5 by Jay Dawg from Excellent sale price The Glen Del blemished buck for $69.99 shipped free is a bargain. Mine does not have the layered vital as shown in the picture, but it is still an outstanding deal. I believe these are old stock (2010 model?) . Had a few minor blemishes, nothing major. Rated 4 out of 5 by Bill from Great Buy ,Great Price . Really pleased with the product , does a good job at stopping the arrows and easy to remove arrows. Love the fact you have four sides to shoot at , and can change the vital area so you don't shoot it out . Also the fact you can purchase a new vital shooting area when needed.Very good price .